Children don’t grow alone. Their growth is accompanied by their growing needs as their little bodies start taking on extreme pressure. During this most energetic phase of their life, continually running, playing, carrying school bags, long computer gaming sessions and growing pains can all cause discomfort and lead to your child learning bad habits. As a parent it’s your duty to keep these potential problems at bay. At Hinterland Physio we share your concern for your children’s health. What’s even greater, our concern goes hand in hand with our ability to help you child grow in the healthiest way possible. We take your child’s growth and development very seriously and our passion for our work enables us to apply the benefits of physiotherapy in your children’s lives. • Devise a special program to suit each child’s needs. The program may involve the use of balance, strength and co-ordination activities, toys, games or other special equipment. • Monitor the child’s progress and alter the program as the child improves, develops and grows. • Help the family understand the child’s problem and teach parents or carers the skills to develop the child’s ability to perform everyday tasks. • Give advice regarding footwear or prescription of equipment to improve the child’s skills and function. • Work in conjunction with other health professionals to meet all the child’s needs in a thorough and comprehensive way. • Refer the child to other health professionals when appropriate. • Consult with the child’s local specialist in the metropolitan or rural community. Good posture is extremely important for everyone. 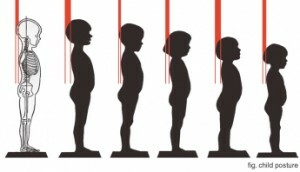 For children, the importance is doubled as their growing age puts more pressure on their bodies. Their tender age requires considerable thought and focus as the habits they develop will shape their adulthood. A good posture is like a good habit, and a bad one like a bad habit. Hinterland Physio has helped a lot of parents with their kids’ posture and over time, we have grown more efficient in helping children correct their posture. The key is the right information and guidance that we offer through our dedicated physiotherapy programs. If you don’t rectify your child’s posture, it will affect them not only presently, but also make the matter worse as he/she grows up. While backpacks are important for kids’ work and lifestyle, they can pose some serious health problems if they are not used properly. The spine has 33 bones called vertebrae and between these are discs that absorb shocks to the body and structure. 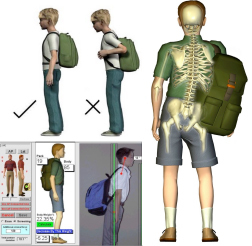 Putting too much pressure on the vertebrae and discs, like incorrectly slinging a large and heavy backpack onto a child’s back, will force the child to compensate for the force of the weight by bending forward. This is bad posture and it makes the spine compress unnaturally. Simpler things like wearing the backpack just from one shoulder also affect posture. We educate children on how to wear their backpacks properly. Our help is crucial for their health as their small age and size means they are lifting loads that are heavier in proportion to their weight. If your 9 year old often complains about aching legs, it’s probably because of growing pains. Common for about 25% to 40% of children, growing pains usually occur in children aged between 3 and 5, and then later when they are between 8 and 12. The causes of growing pains are usually considered to be bad posture, tiredness and fatigue especially after a particularly active day. Children run, climb and jump a lot, not to mention the irregular sized backpacks they carry. All this contributes to growing pains. Helping a child experiencing growing pains is not like treating a kid with some muscular disease or injury. Like growing pains, physiotherapy is natural and hence extremely effective in dealing with the pain. Growing pains wear off with time but how well you handle them while they occur will affect your child immensely. Hinterland Physio specialists diagnose whether your child is having growing pains or the pain has some other reason. In the case of growing pains, our physiotherapy helps your child through effective exercises, useful advice and invaluable assurance. Precise exercises such as stretching and strengthening weak or tight muscles can work wonders for a child experiencing growing pains. Our physiotherapy specialists help parents and their kids not only through their expertise, but also through their commitment and dedication that makes all Hinterland Physio’s clients feel better the moment they step into our physiotherapy clinic. Hinterland Physio in Gladstone & Bilioela proudly offers Dry Needling to the the Hinterland, Nerang & Gold Coast communities. Dry needling is a modality that has been found to be successful in relieving trigger points. Not to be confused with the oriental practice of acupuncture, dry needling is being used successfully by physiotherapists who are suitably trained in this technique. There are two categories of dry needling-superficial dry needling and deep dry needling. As the name implies, superficial dry needling does not reach the myofascial trigger points and is painless. With deep dry needling the needle goes directly into the myofascial trigger points, eliciting a twitch response, similar to what occurs when the knots are palpated. The twitch response shows that the needle has reached the knot and pain is reduced or relieved immediately. Deep dry needling may trigger a person’s referred pain. For example, dry needling of myofascial trigger points in the upper trapezius (upper back) or sternocleidomastoid muscles (at the side of the neck) may trigger the patient’s migraine. It is to be noted that dry needling can cause some soreness that may last one or two days. Contact us to discuss the suitability of this treatment for you. 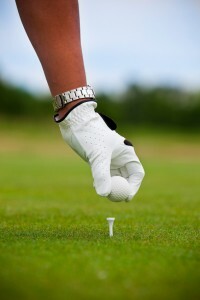 Hinterland Physio provides a specialized rehabilitation program for golf injuries. Our golf rehabilitation not only helps golfers recover from their injuries, but also improves their game . Our physiotherapists have the skill, experience and equipment to get your health and game in perfect shape. To match your specific golf problems and your desired outcomes in the game, our physiotherapists can devise a golf-specific exercise program. The program will be targeted at your weaknesses, and geared towards assisting your recovery and enhancing your golf. Benefits may include increasing the distance of your drive, improve your swing, or achieving more trunk rotation. Review golf technique – stance, back swing, follow though phase. Shayne Podbury, the director of Hinterland Physio, previously played among the worlds top ranked tennis players and leads Hinterland Physio’s tennis rehabilitation program. His dual qualifications in tennis and physiotherapy, makes him the ideal person for you to seek help and guidance regarding rehabilitation for tennis injuries. Shayne specialises in assessment, treatment and rehabilitation for all tennis injuries, and also conducts musculo-skeletal screenings for tennis players. An important component of the physiotherapy evaluation of a tennis injury is to find the cause of the injury, rather than focussing on the symptoms. At Hinterland Physio we take the time required to develop an effective treatment to get you back to full fitness in the safest and fast way possible. Our goal is to have you, the athlete, return to a level of conditioning that is equal or above your pre-injury status. Hinterland Physio works with WorkCover and Employers to deliver outcome-focused and goal-orientated services to injured workers. Following principles set by WorkCover, Hinterland Physio help workers return to work as quickly and safely as possible. We guide patients through recovery from beginning to end and ensure they are returned to work rehabilitated and well educated to prevent further damage. Hinterland Physio delivers exceptional service. Educating the injured worker on the importance of staying active and, if possible, to remain at work is a very important component in the recovery process. This helps to restore function, decrease disability, and increases the likelihood of returning the worker to full duties sooner. We believe that communication between WorkCover, treating medical practitioners, the employer, and other service providers are vital to ensure everyone involved is fully informed on the workers progress – this helps to provide a better outcome for the worker. It is important that the worker is rehabilitated physically and psychologically, so Hinterland Physio identifies any risks that may hinder their recovery or return to work. Hinterland Physio helps to set realistic goals with the WorkCover case manager that focus on suitable duties and return to work. If a worker fails to reach the required abilities to return to their original working duties, Hinterland Physio will visit the workplace with the employer to identify suitable duties beneficial to the employer and worker alike. If there are no suitable duties for the worker, Hinterland Physio will assist in finding host employment at an alternative place of employment until the worker is fully rehabilitated. Hinterland Physio has providers in Physiotherapy, Occupational Therapy, and Exercise Physiology to help deliver the best outcome for workers, employers and WorkCover.